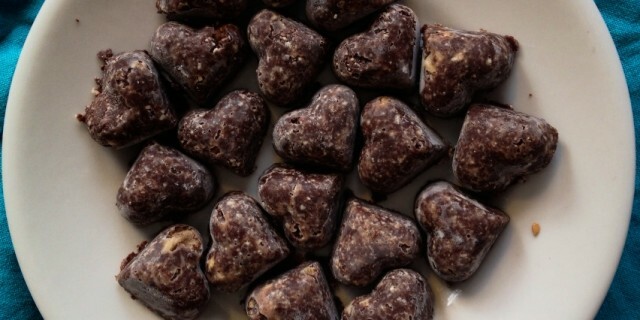 Eat your heart out with this simple and delicious recipe for Raw Ginger Chili Chocolate Hearts. This is one of my favorite combinations but you can go creative and add nuts, dried fruits, coconutflakes or superfoods like spirulina. Doesn’t this recipe sound delicious and easy to make? I love making raw chocolate to satisfy my chocolate cravings. Did you know this is a super healthy alternative to store-bought, processed chocolate? Cacao contains the highest concentration of of antioxidants of any food in the world with protects us from free radical damage. Cacao is also a rich source of essential minerals like magnesium, iron, chromium, manganese, zinc and copper. Cacao is rich in serotonin, a primary neurotransmitter that makes you feel good. Raw cocao powder is also rich in Vitamin C which gets lost in cooked and processed chocolate. Do you want to know more about the benefits of raw cacao? Have a look at David Wolfe’s book Superfoods. If coconut oil is solid, melt the coconut oil first so it’s completely liquified. An easy way to do this is to place the oil in a cup and place the cup in a big bowl with hot water. Make sure the water does not mix with the oil. Mix all ingredients in a blender until smooth, except for the almond and walnuts. Put mixture in a bowl and add the walnuts and almond flour. Mix well. Place chocolate mixture in a mould or pour into a baking tray. You can also roll little chocolate balls and place the on the tray. Set into the fridge or freezer until solid.